The meeting with Wynton was not the only time I visted the Marsalis household. I made a couple other trips there during my pizza delivery career. 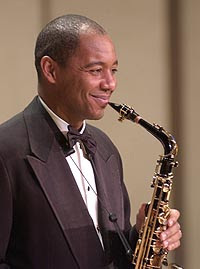 During one of the trips, I had the pleasure of meeting jazz saxophonist, and ex Tonight Show bandleader Branford Marsalis. He sure was different than his brother. He was a tall and gangly guy, and very friendly. He came out to talk to me, and smiled a lot and cracked jokes. Definitely a cool guy to hang with. When I went to give him his pizza, he asked how much it was. It was the same type I had brought to Wyton, the same price. This time, though, Branford gave me $20, and told me to keep the change. Like I said, definitely a cool guy. Especially if you're a pizza guy who makes a living off of tips.